Emerald Hill Golf Course opened in 1923. The course was purchased and renovated by the Sterling Park District in 1994. Emerald Hill Golf Course features 18 holes, a driving range, three practice greens, and a practice chipping area. 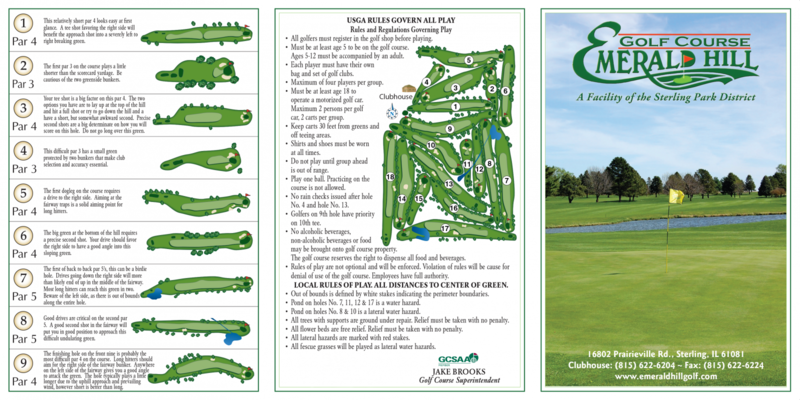 The course is primarily bentgrass greens with Kentucky bluegrass tees, fairways and rough. The clubhouse features a well-supplied pro shop that is open daily. The open-air Pavilion is perfect for hosting weddings, outings, tournaments, private parties or in providing a scenic view for some post-round beverages. Emerald Hill Golf Course is a pleasure for golfers of any skill level. The course will challenge you while providing a relaxing, picturesque backdrop. Test your accuracy with our fairways, water hazards, and sand traps; we have everything you need to challenge you and improve your game. Our goal is to provide you with a quality experience that includes exceptional service and a comfortable atmosphere. Emerald Hill Golf Course offers the best in equipment and apparel to compliment your game. Stop by our pro shop before and after your round. Our friendly staff will help you make tee times, rent a golf cart and register you and your guests before each round of golf. An excellent selection of golf balls, hats and accessories are sold in the pro shop. Golf lessons are also available. 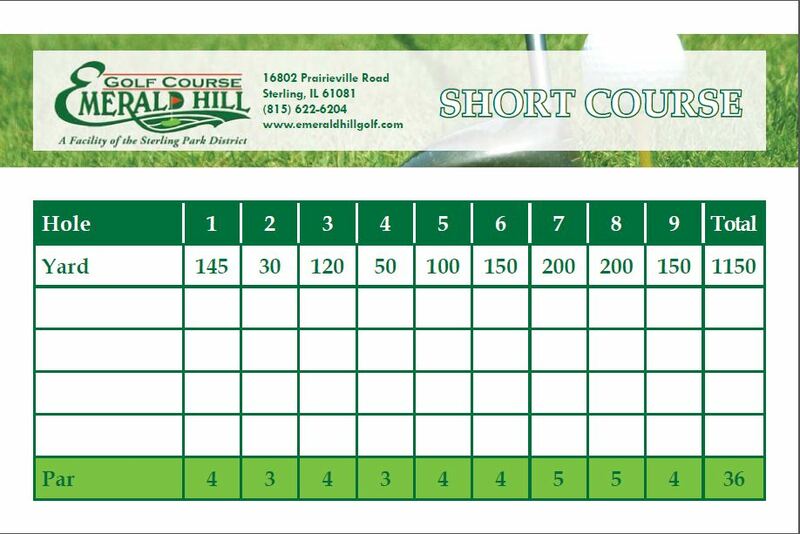 Emerald Hill Golf Course offers chipping and putting areas and is the perfect place to improve your short game. The course is also equipped with a driving range. What better way to take your game to the next level this year? Make time to perfect your swing and improve your golf game today. Stop by Mulligan’s Grill for a cold beverage, snack or a full meal. Mulligan’s is generally open from 11:00 am – 3 pm daily. When Mulligan’s is closed, the pro shop is open and has drinks and snacks available. Overlooking the 4th tee of Emerald Hill Golf Course, you will enjoy an elegant atmosphere as our experienced staff assists you in arranging your special event. The Pavillion seats up to 150 people and offers a portable dance floor and bar. It’s perfect for wedding receptions, golf outings, class and family reunions, prom, and retirement and birthday parties! Catering services are available. For more information and a customized quote, please complete our request form.